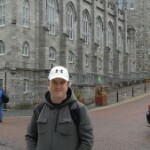 As a follow up to my previous post, I thought it'd be interesting and useful information to share exactly how much I paid to fly my dog to Ireland (from California). This is a guide only. A lot of factors will impact your own costs e.g. size and weight of your dog, kennel size, pet re-locator you choose, cost of veterinarian visits where you live etc. This cost breakdown is for a 25 pound dog, travelling in a 32Lx23Wx25H crate from LAX to Dublin. Veterinarian costs - 3 visits at a total cost of $323. This covered pet passport documentation, treatment for tapeworm, rabies vaccination and final health check. Microchip - your pet must have an approved microchip to travel on the EU pet passport scheme. My dog already had one of these, so I did not include that in my cost breakdown. Travel crate - I had a pet travel crate from my previous international moves. These can be quite expensive so I suggest shopping around. Also, keep in mind that many people will use their travel crate just once while moving, and will want to sell it afterwards. 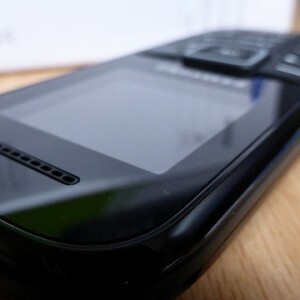 You may be able to pick up a used one at a fraction of the cost. 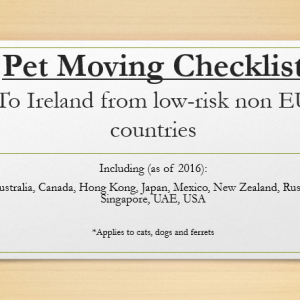 Be sure it meets your airline's requirements (you're pet re-locator should be able to guide you). If you have shipped a dog (or any other pet) to Ireland from anywhere in the world, please use the comments section or form below if you have a price breakdown of your own you can share. 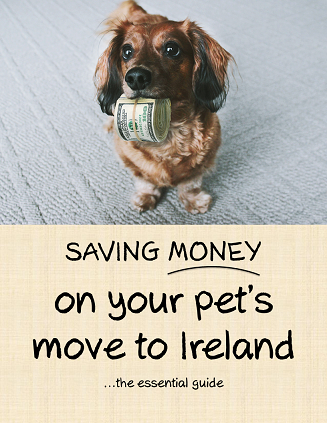 Sending your pet to Ireland? I can help you save. oh boy…i have 4 animals…should i expect 10 grand to move my fur babies???? 1 chihuahua 10 pounds, cattle dog mix medium size about 40 pounds, cattle dog mix about 30 pounds, and a cat…but he thinks he is human! @redhead : maybe!! 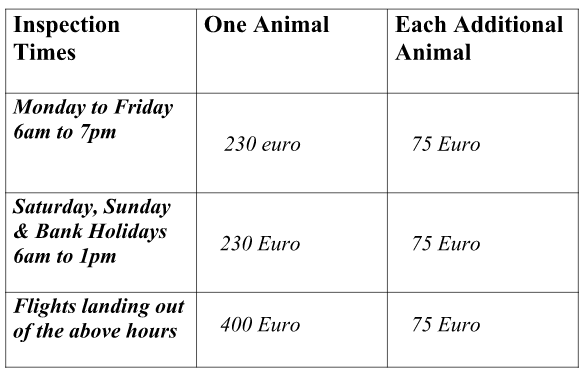 However, there are alternatives, such as travelling to another EU country via ferry with the animals, and then coming to Ireland from there. Flying animals is very expensive. Where are you moving from? Hey Liam. 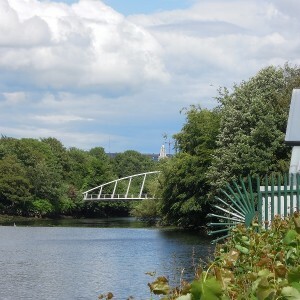 How much did the clearing cost @ Lissenhall? I got a quote from United for $600… and PetExpress for $2120. Different between the two is the paperwork, transportation, clearance at Dublin etc. Just trying to work out if there is much in it when you spread it all out. Sorry for the confusion. That’s what I called “Dept of Agriculture/veterinarian fee in Dublin” above in the post. I contacted Lissenhall myself back in mid-2014 for the information. The table of fees below is what they sent me. I paid 230 Euro. For most current info, you might want to email them. Are you sure PetExpress are including that fee? Make sure you see that in writing, because I had to pay it when my pet landed, even though I used a pet mover. One of our readers here, Kelsey (@kwalsh112), is planning her move to Ireland and has received the following quote for her cat to be sent to Ireland from the East coast of the United States. It’s important to note what is, and what’s not (very important!) included in the quote. -Ongoing advice regarding preparation for travel, travel crates, veterinary requirements, etc. Thanks for sharing this info, Kelsey.